It seems like the time between winter break and spring break is the longest time of the school year. It is often dark when you are driving into work and when you are driving home from work. If you don’t go outside for recess, you don’t see much sunlight that day. Add to that, one too many inside recesses, seasonal viruses, irritable students, and you’ve got a faculty that is beginning to go a little stir crazy. You’ve heard the old expression about the way to a man’s heart is through his stomach, well the same holds true for teachers. Food is the cure for the winter blues and the upcoming Super Bowl provides the perfect theme. Listen up, Social Committee or Sunshine Committee members! A soup and chili luncheon is one of the easiest luncheons to plan. You know how you usually get complaints from the teachers who have the last lunch period? By the time they get to eat, the food is picked over, too cold, or too hot. They aren’t being Goldilocks, it’s just the reality of having the last lunch period. It’s not fair to them. Since the soups and chili are in crockpots the temperature issue is solved. 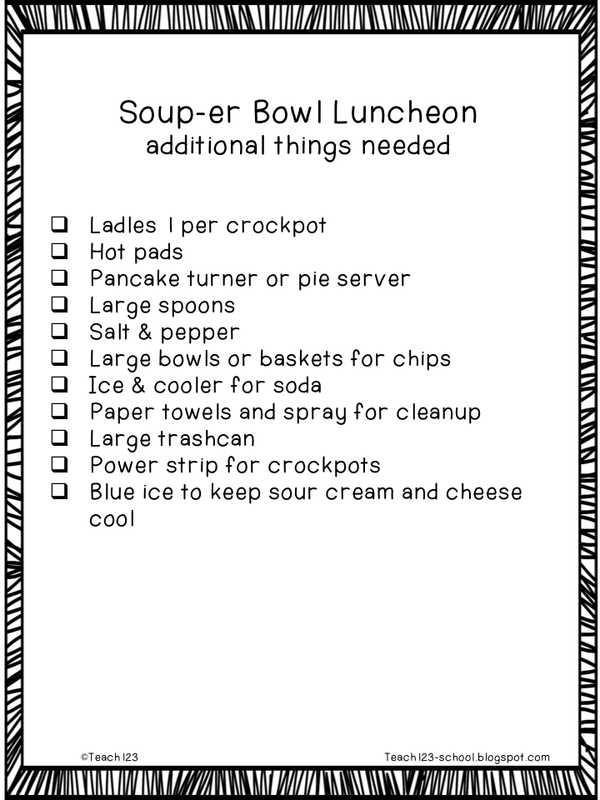 As long as you have plenty of people volunteer to bring in soup and chili there will be enough for all of the lunch periods. 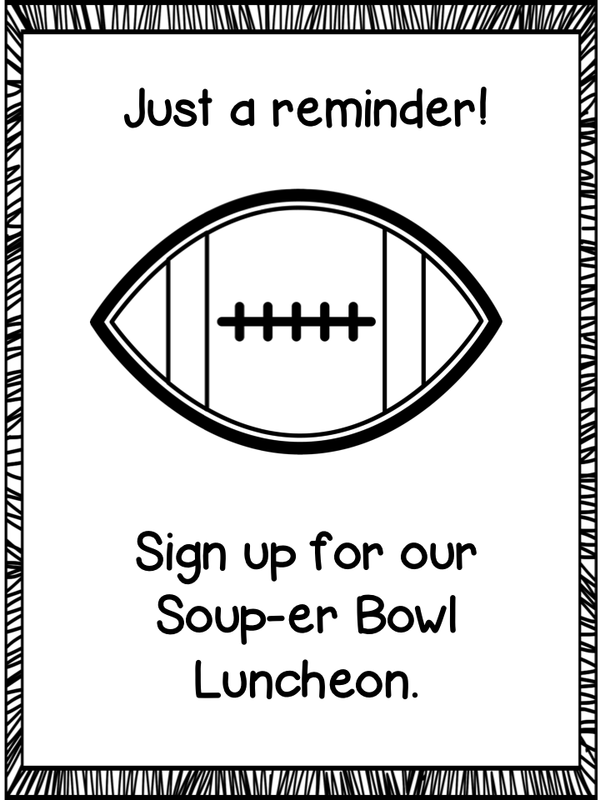 Nowadays with Pinterest you won’t have trouble getting people to sign up to bring in soups. Just remind them to go check their Pinterest boards for a good soup recipe. I have a Pinterest board that you can share with them, too. 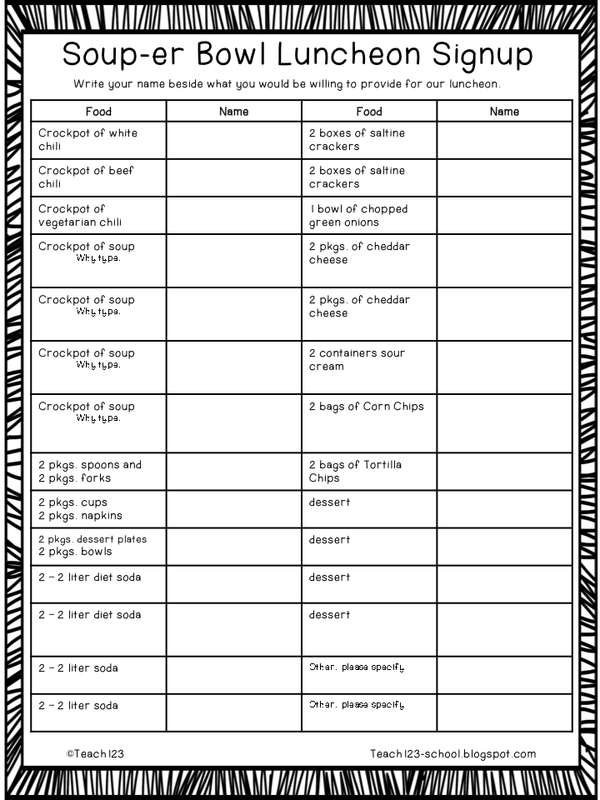 To make things a little easier, I made a signup list, reminder note, and a list of additional supplies that you’ll need for the luncheon. You can download it for free below. Looking for more sunshine committee ideas? This post has a collection of ideas that are fun. We have luncheons all the time at our school. It is always so much fun to see what everyone brings in and it makes for a yummy lunch.